Originally Submitted to FurAffinity.net on Oct 5th, 2012 05:33 AM. Before it was transferred to Inkbunny it had 117 views and 6 favorites. This is a random drawing I did while doodling in my sketch book. 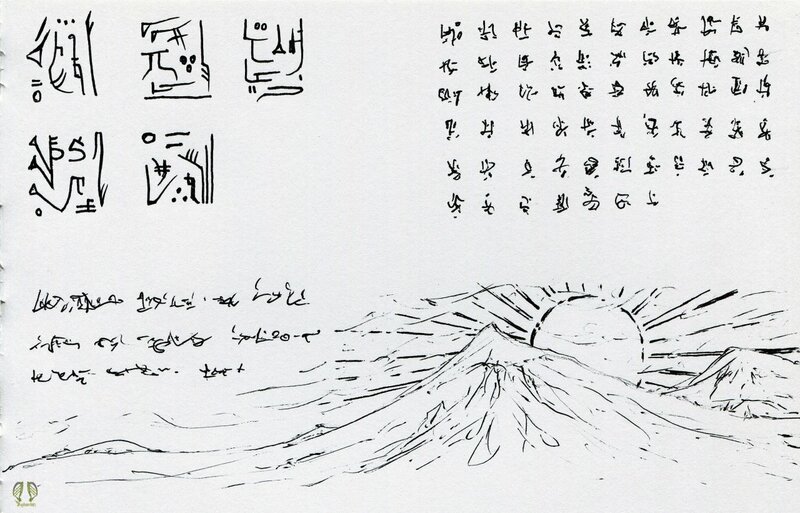 At first, I was trying out different styles of the Adlerian language and then, after the third block of made up text, I thought it would look cool to add a mountain scenes in an ink painting style, like in some Japanese and other Asian texts and scrolls. After that, I figured the text in the top left corner would be an example of temple script found on temples and used mainly by priests and monks of Adleria. And the text in the top right corner would be used by the rich, wealthy and highly educated elite of Adleria and would be very formal and highly descriptive and in detail. Then the text in the lower left area would be used by and popular with the common folk of Adleria due to its simplified, expressive style that has the added bonus of being written quickly as well. The temple text is an old text style and scarcely changed through the years. At one time the only written Adlerian, it was used by the priests and monks since and rarely changed. It is based off a mix of Egyptian hieroglyphics, Sumerian, cuneiform and Mandarin. I figure this kind is about 17,000 years old. The second text is mostly based off of Mandarin and Japanese in look and I find to be the second oldest in Adlerian. The rich and wealthy of Adleria found the time to receive an education and, due to their ample time, formal behavior and conservative attitudes, created a need to be detailed on even simple matters. Kind of like taking 5 minutes to say 'no' for example. LOL. ^\/^.
. I figured it would be about 3,500 years old. The last one is the newest and came about 700 years ago when education became more standard and available to the entire population of Adleria. Also, the need to be quick and a tendency to be expressive among the common folk, many by whom make up a large arts, crafts, smithing and jewel crafting class. Their renown in making weapons, jewelry, armor, and art in general is of such popularity that the need to be quick is prevalent. ^\/^. After figuring the script types out and thinking that each block says the same thing, but in different scripts and such, that this page can be read by either group. And, with the nice picture added before hand, I find that this would be like a page from a religious document. Since I made up a religion for the people of Adleria, a religion centered around the worship of wind, then this would be a page from the bible or some other religious text related to said religion. Thus I named this picture 'Page from the Book of Divine Winds'. ^\/^.